The Australian desert ecosystem coevolved with humans over the course of fifty millennia, yet our understanding of the place of humans within the ecosystem is only now beginning to deepen; recent research suggests that the removal of Aboriginal people from homelands precipitated rapid ecosystem remodeling. 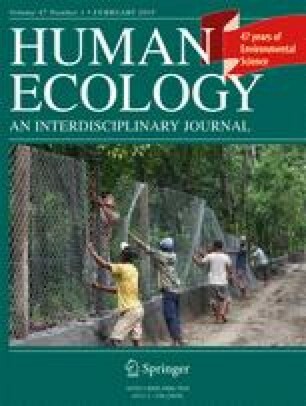 We suggest that network-based approaches are instrumental in broadening our understanding of humans in ecosystems, so apply these approaches to examine nomadic-era ecosystems (when Aboriginal people lived exclusive foraging-based lifeways) and contemporary-era ecosystems (when Aboriginal people live a mixed-based economy lifestyle). Using the approach of food web modeling we explicitly place Martu Aboriginal foragers within the overall ecosystem of the Western Desert. By linking humans to the other biota in the desert, examining each species as nodes in a network and each consumption link as edges in the network, we can better understand the ways the network connectedness shifts between nomadic-era and contemporary-era food webs. Using network randomization simulations we show that the contemporary food webs deviate significantly from the nomadic era food webs, suggesting a key role of humans as “knitters” of the ecosystem. This work has implications for research on resilient ecosystems, both within Australia and beyond, and suggests that humans have significant roles to play in sustainability and resilience. The online version of this article ( https://doi.org/10.1007/s10745-019-0053-z) contains supplementary material, which is available to authorized users. First and foremost our gratitude goes to all of our Martu colleagues, friends, and family that have made this work possible. This work has been generously supported by grants from the National Science Foundation (BCS-1459880) and the Max Planck Institute for Evolutionary Anthropology. Bliege Bird, R., and Nimmo, D. (2018). Restore the lost ecological functions of people. Nat Ecol Evol. https://doi.org/10.1038/s41559-018-0576-5. Dunne, J. A., Lafferty, K. D., Dobson, A. P., et al (2013). Parasites affect food web structure primarily through increased diversity and complexity. PLoS Biol 11. https://doi.org/10.1371/journal.pbio.1001579. McGregor, H. W., Legge, S., Jones, M. E., and Johnson, C. N. (2014). Landscape management of fire and grazing regimes alters the fine-scale habitat utilisation by feral cats. PLoS One 9. https://doi.org/10.1371/journal.pone.0109097. Walsh, F. J., Dobson, P. V., and Douglas, J. C. (2013). Anpernirrentye: A framework for enhanced application of indigenous ecological knowledge in natural resource management. Ecol Soc 18. https://doi.org/10.5751/ES-05501-180318.